The Champ Austria Petrol Jet Stream Lighter provides pipe smoking vintage lighter enthusiasts another alternative to butane lighters. 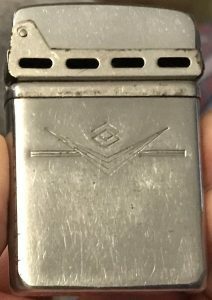 The Champ Jet Stream Lighter is a petrol lighter that hit the scene around 1950 and is similar to the Beattie Jet Lighter with a few(mostly aesthetic) differences. 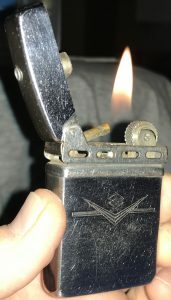 Both lighters achieve shooting a two to three inch flame by simply tilting the brass jet tip toward the lit petrol wick. 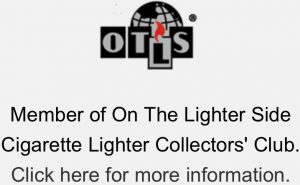 I have talked in detail about the Beattie Jet Lighter here. 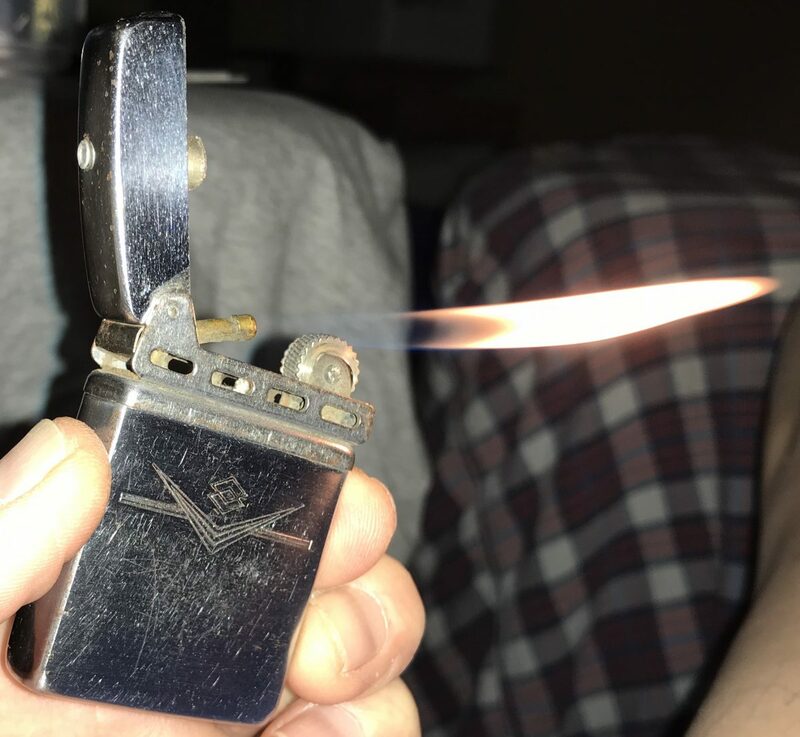 You have a petrol/fluid lighter that’s handy to light your cigarette like a Zippo and also, with the tilt of your wrist, reach down and light your bowl like a butane flame. In many respects, it seems the designers of the Champ Jet Stream felt the need to clone the Beattie Jet. Like they wanted it to resemble the Beattie even if it wasn’t necessary. Examples of this would include the horizontal slots on the wind guard, the lid spring and the stylish “JET” lettering on the bottom of the case. The Champ differs with its less bulky, square case which makes it much easier to manage with one hand than the Beattie. The lid is taller and more bulky. 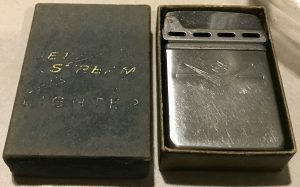 In the hand, it feels more like a Zippo, easy to spark but a little clunky in the opening. The two lighters function off the same principles: lit wick heats jet tube which is a vaporization chamber thanks to the fluid soaked wick stuffed into the terminal end of the tube. I was really surprised how quickly I was able to tune this Champ Jet Stream up and have it hissing and shooting flame like it’s supposed to. There’s a couple Beattie Jets I’ve been fooling around with for months that haven’t spit a flame like this Champ does. And it does seem like these lighters can really burn through some fuel. Practically speaking, that’s not really an issue because with petrol lighters there is always some degree of fuel loss or waste. So, if you plan on using it to meet people at parties, bring extra fluid. Otherwise, you should be fine. As far as functional differences that set the Champ Jet apart, this lighter has a removable flint wheel. That could come in very handy should the sparking mechanism ever fail. 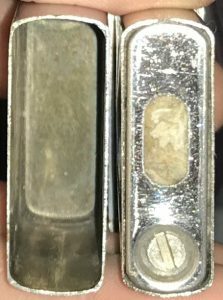 Zippo and Beattie both have flint wheels that are riveted in place, complicating their ability to be repaired. The jet tube is not anchored and appears to be designed to be supported completely by the hole through which it enters the deck of the lighter and the wadding in the tank. And that was fine, with the wadding positioned correctly, the tube stayed in place. This is all helped by a retention plate that holds everything in snugly under the pressure of the flint screw. The jet tube is straight from the point that it goes under the deck of the lighter allowing easy access to the terminal end of the tube. Beatties have a curved tube that results in blindly stuffing the wick into the tube. Not a huge issue but at least you know you’ll be able to see what you’re working on if it becomes necessary. I’m not sure how much precision went into the manufacturing of the Champ Jet Stream. When I first held the lighter in my hand, it wasn’t very impressive. It was dirty and dinghy and things seemed to move in ways they shouldn’t and couldn’t but did. That’s when I began to take note of subtle shifts that affected the overall alignment of the lighter. At times the snuffer would catch on the jet tube. That’s when I realized the jet tube was not anchored and the way the lighter tank had been packed, the jet tube had some movement. So, I unpacked, repositioned the tube and repacked the tank. That was good because now the jet tube didn’t move if it got bumped. Then at other times, the snuffer began to catch on the flint wheel. That’s when I realized the snuffer was riveted to the lid and had a little play in it, so I’m just going to have to live with it and hope I can remember to keep pressure on that rivet with a finger as I close it. There are also advantages to some of what seemed, at least at first, like a lack of precision. For example, if the jet tube is anchored and has enough pressure exerted against it, it could break. An unanchored tube would be more likely to give without breaking if movement is possible. And while it might seem less sturdy, once it’s all packed up all nice and tidy in the case, what you got to worry about other than a pocket full of petroleum distillate and ferrocerium? 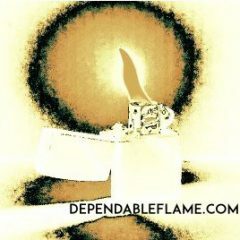 I want to thank you for reading about the Champ Jet Stream Petrol Lighter and I’d like to draw your attention to two features of dependableflame.com that could help us better help you. First, subscribe to our email list. You will never receive spammy emails from dependableflame.com. We can, however keep you updated with the latest vintage lighters we have to offer, info on Huntington’s Disease research and awareness, cannabis legalization, vaporizers and whatever else we may get into in these posts. And last, use the comments section below this article to let us know what you think of the Champ Jet or tell us about your favorite lighter. If you have questions, email and text are also available any time. Hey, I just purchased one of these. How the heck do you refill it? Hey, Frank, congratulations! That’s a cool little piece of tobacciana you purchased. To refill the Champ Jet Stream Petrol Lighter, remove the insert from the case just like got would for a Zippo. Turn it upside down and you should have a plate covering the bottom with a long narrow slot in it. You can send the fluid straight through that slot. Be cautious as the lighter gets full, you may have to slow down the pace. The plate can be removed by loosening the flint screw if you need to get in there. Make sure to dry any excess and allow fumes to disperse before striking the lighter. You will burn through a lot of fuel experimenting with these jet lighters but you’ll also have a lot of fun. Next Next post: The Great Ebay Feedback Debate: Should Ebay Sellers Leave Feedback for Buyers?